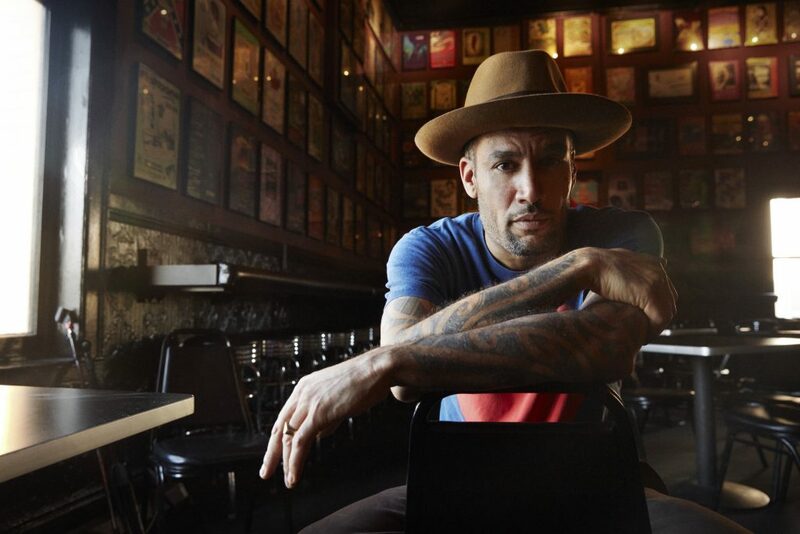 Most modern musical artists who also qualify as civil rights activists come from the hip-hop world, but Ben Harper has weaved humanitarian ideals into his complex web of blues, reggae, rock, gospel, folk and funk since starting his solo recording career nearly 25 years ago. And the 47-year-old California native, for the most part, let the music do the talking during a memorable 90-plus-minute show at SunFest on Thursday. The threat of rain pushed the scheduled 8 p.m. start time to 8:30 at the Meyer Ampitheater’s Tire Kingdom Stage, but Harper & the Innocent Criminals’ protest music proved worth the wait in a performance that equaled the singer/guitarist’s scintillating 2010 SunFest appearance on the Ford Main Stage with his Relentless 7 lineup. The bandleader reunited the Innocent Criminals in 2015 after an eight-year hiatus, and the classic lineup with bassist/vocalist Juan Nelson, guitarist Michael Ward, keyboardist Jason Yates, drummer/vocalist Oliver Charles, and percussionist/vocalist Leon Mobley appears on Harper’s latest CD, last year’s Call It What It Is (Stax Records). With Ward subsequently out of the lineup, Harper grabbed ever-capable Relentless 7 guitarist Jason Mozersky as a replacement, and the sextet opened with ominous tracks from that latest release. The self-descriptive “How Dark is Gone” then upped the energy level via a frenetic early Santana influence. Harper shed his guitar to sing while playing hand-held shakers; Yates initially played acoustic guitar before going back to keyboards, and Charles left the drum kit to join Nelson behind his rig, playing congas as the percussionist added djembe and cymbal accents. Switching to lap steel guitar, Harper preached “There must be more good than bad” on the gospel-tinged title track from his 1994 debut Welcome To the Cruel World, then brought the funk on the title track from his sophomore 1995 release, Fight for Your Mind. Nelson, who rose to prominence with Harper during the Innocent Criminals’ initial 15-year run, took the spotlight in the latter with an extended solo, plus trades with Harper, that included slapping and finger-style chording reminiscent of jazz/fusion titan Stanley Clarke. If Marley is Harper’s primary songwriting influence, Hendrix seems to be his prominent guitar inspiration. The funky blues of “Ground on Down” (from Fight for Your Mind) featured a nasty slide intro and wild solo on lap steel; the anthemic “Better Way” (from Both Sides of the Gun, 2006) had the same effect — yet this time on a pedal steel guitar — and the extended retro jam of “Keep It Together (So I Can Fall Apart)” (from White Lies for Dark Times, 2009) showcased intoxicating left-hand fretting work as Harper played lap steel through a wah-wah pedal. The latter also featured a bluesy, memorable solo by the workmanlike Mozersky and an atmospheric Fender Rhodes electric piano break by Yates, whose multitude of tones provided essential ingredients all night. In-between, Harper chose effective, crowd-pleasing faves like the ballad title track from Diamonds on the Inside (2003); the poppy “Steal My Kisses,” with Mobley playing the box-like cajon while sitting on it out front, a rocking “Burn To Shine” (both from Burn To Shine, 1999), and self-explanatory “Burn One Down” (from Fight for Your Mind), with the percussionist roaming the stage playing a djembe on a strap around his neck. As the clock swept past 10 p.m., Harper ended the show as it began, on a reggae note, but not before raging against the sociopolitical machine one more time. The subsequent DIY anthem “With My Own Two Hands,” from Diamonds on the Inside, featured another fiery Harper delivery, sing-along backing vocals, and additional banner solos by Mozersky and Yates, this time on Hammond organ. Afterward, Harper gathered the sextet for a bow and thanked the entire SunFest staff, down to the backstage caterers, along with his own touring crew. It was a classy, dignified statement by a songwriter whose lyrics often rail against powers that be who fail to display such exemplary traits.